In March, the more hardy members of New Barn Riders donned gloves, hats, scarves and sweaters to attend a demonstration of drill riding, organised by Pam Rigby at New Barn, Ollerton, Cheshire. Pam’s very experienced at drill rides, having competed at the Championships at Olympia several times, and having braved the cold, we were all keen to see how the different components of the ride were built up. Her four demonstration horses were deliberately chosen to illustrate the point, and ranged from a small pony to a large cob. “When you’re starting off your horses together, keep a close eye on their body language,” she said. Keep a good distance between them to start with, to keep them feeling comfortable, as it will sometimes take a new group a while to settle. Split into two pairs, and starting from opposite ends of the arena, ride towards each other to check the horses’ reaction, but make sure you’ve got plenty of space. “Accuracy and straightness are vital, so that each rider in the team knows where they’re supposed to be and where everyone else is – the rider needs to stay in total control. “Test for potential nappiness by riding across the arena in a group and then dividing, as some of the horses may want to stay together and resist splitting up. Stick to walk and trot for the first few sessions. 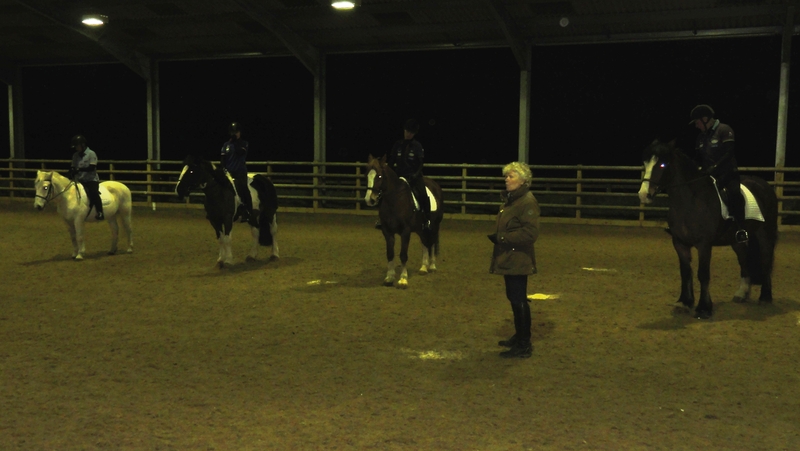 Pam and her team – Sandra on Pip, Janet on Badger, Helen on Salsa and Gill on Fergal – then demonstrated ‘scissors’, where the ride split into two pairs and rode round the arena in opposite directions. When the first rider of each pair reached the corner, they turned diagnonally across the school, being careful to space themselves so that they passed one in front of the other at the centre point. The second rider of each pair followed on, so that the horses wove in between each other. Why learn to drill ride? Drill riding is a good way of strengthening the bond between horse and rider, and it makes the horse more supple and obedient. A disadvantage, however, is that the horse and rider must keep moving to keep their relative place in the team, so it’s not a good environment for sorting out schooling problems. To find out more about lectures and demonstrations at New Barn, visit What’s on at New Barn.